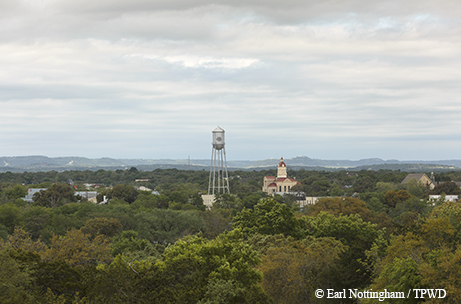 Bandera boasts cowboys, horses, gunfights and the natural beauty of the Hill Country. A few years ago the Texas Legislature made it official: Bandera is the Cowboy Capital of the World. The locals didn’t need convincing, as they’ve claimed that moniker proudly for years, with or without an official resolution. Since the cattle drives of the late 1800s, this Hill Country town has embraced its Western heritage, inviting visitors to come experience authentic cowboy culture. Bandera dude ranches have been attracting tourists for decades, and today there are about a dozen in operation. Most are geared toward families, offering trail rides and communal chuck wagon meals. The Hill Country Equestrian Lodge is our base of operations, due to its proximity to the Hill Country State Natural Area and glowing online reviews about equestrian instruction. I can count on one hand the number of times I’ve been on a horse; my husband’s last experience was more than 30 years ago, and it wasn’t a good one. We vowed that we couldn’t go to Bandera without at least attempting to get back in the saddle. The lodge also offers meal options, allowing us to sample several culinary choices during our visit. We arrive just as the sun is going down, the first of several beautiful sunrises and sunsets we’ll enjoy during our stay. We check in at the beautiful old ranch house, confirming a riding lesson with owner Dianne Lindig. Our cozy cabin has everything we need for a comfortable stay away from the hustle and bustle of city life. No TV, no Internet and no cell service — a welcome respite, indeed. That first evening we relax on the porch, taking in the night sounds and watching the full moon rise. After a good night’s sleep and a do-it-yourself breakfast from supplied provisions in the cabin’s kitchen, we head down the road to visit the state natural area. Park ranger Leanne Beauxbeannes, who leads us on a nature hike, describes herself as being “on the other side of her 60s” and says she became a park ranger late in life after experiencing the Texas Master Naturalist program. Beauxbeannes, a cheerful and knowledgeable guide, shares stories about her nature experiences. She points out fossils, flowers and butterflies, including a dramatic pipevine swallowtail with vibrant blue wings, and tall, yellow Maximilian sunflowers scattered about for their showy season. Famished from our hike, we head downtown for lunch. Fortified with barbecue, we stroll through the shops and marvel at the dozens of motorcyclists driving down Main Street. The afternoon’s plan includes Bandera’s museums, though the brand new natural history museum isn’t due to open till June 18. At the time of our visit, the 8,000-square-foot building had just been constructed. The idea for the museum took root when local resident and lifelong hunter Juan Carlos Infante donated his sizable collection of full-body wildlife mounts for public display. Several local leaders got involved, a board of directors was formed, and the idea blossomed into the Bandera Natural History Museum, complete with a dinosaur park. Infante led us through the galleries as artists busily painted the dioramas for the animal mounts. Children can learn more about the wildlife inside and the dinosaur replicas outside at planned educational stations. Infante, originally from Argentina, has owned a ranch in the area for 40 years. The new facility will be a nice complement to Bandera’s longtime cultural attraction, the Frontier Times Museum. This quirky little place has been around since 1933, when local publisher John Marvin Hunter opened its doors to share his collection of Western memorabilia. Since then, the museum has attracted all sorts of unusual donations, including weird curiosities such as a two-headed kid goat and a shrunken head. We duck in thinking we’ll be there for just a bit, but the oddball collection, interspersed with various articles of daily life from a bygone era, has us intrigued for almost two hours. We take a late afternoon break back at the lodge for a quick dip in the pool, and then the hot tub. We are joined by some new arrivals, a group of three girlfriends from Houston who brought their horses along for the weekend. They’re looking forward to riding through the state natural area, as well as some in-cabin spa treatments. Spa treatments and a hot tub? Cowboys never had it so good! We venture back out for dinner and stop in at Arkey Blue’s Silver Dollar Saloon afterward. This is a real-deal honky-tonk, with sawdust on the floor, a few regulars perched on barstools and plenty of old favorites on the jukebox. We enjoy the ambience for a short while before calling it a night. Hill Country State Natural Area. The ride through the ranch is wonderful, and we both enjoy it immensely, way more than we had anticipated. At one point, my trusty steed takes off in a brisk trot, but after a few terrifying seconds, I settle into the horse’s movement and enjoy the adventure. After the morning trail ride, we understand what the online accolades are all about. Lindig loves horses and excels at sharing what she knows. 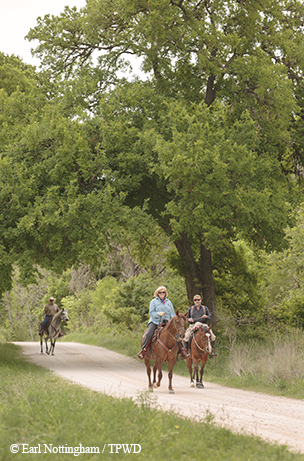 For the second half of the day, we venture toward Lost Maples State Natural Area, after a stop at the Lost Maples Cafe in Utopia — horseback riding is hungry work. We fill up on locally sourced lamb burgers topped with feta, a somewhat surprising find at a small-town eatery, then head to the natural area to walk it off. We explore the easy Maple Trail and are rewarded with more butterfly sightings, lots of flowers and even a lizard, as white as the rock it was lying on. Nature’s camouflage is amazing. On our way back to the car, we spot some bright yellow Maximilian sunflowers, and are happy we could now put a name to them. Refreshed with our nature break, we hit the road and pull into the Lone Star Motorcycle Museum a few miles away. Co-owner Debbie Johncock explains with a laugh that the treasure trove of vintage bikes started as her husband’s personal collection but got out of control. Now it’s a popular destination for the many bikers who traverse the scenic back roads of this part of Texas. A few more miles down the road, we stop in at the Lost Maples Winery at Polvadeau Vineyards, the first commercial winery and vineyard in Bandera County. Owners Tom and Glenda Slaughter are stewarding land that has been in Glenda’s family for more than 175 years. Glenda says her grandmother grew grapes here decades ago, and when they were deciding what to do next, they reasoned that if grapes were good enough for grandma, they should work fine for them, too. “I think if she were still here today she would be very happy at how we’re taking care of it,” she says. The following morning, we enjoy an in-cabin massage and then head downtown for lunch at the Old Spanish Trail restaurant. The venerable Bandera institution dishes up Tex-Mex and other favorites that any cowboy would love. On the way out of town, we stop in at the visitors center, where a slightly corny gunfight delights the audience members, many from Europe. As we head out of town, we agree that Bandera brings together cowboy culture, the beauty of nature and modern creature comforts, and that combination makes for a memorable visit to the Cowboy Capital of the World.